So, you’re interested in a Bushnell rangefinder, huh? I can’t say that I blame you, since this company has made quite a name for itself in the optics industry. Bushnell also has a habit of teaming up with other hunting manufacturers and organizations, bringing big names like Bone Collector to its product lineup. On top of that, this company has begun truly advancing the technology of the rangefinder to the 21st century. Let’s take a look at what you can expect from these products, as well as some recommendations for those on limited and unlimited budgets. What Is Bushnell’s Best Budget-Friendly Rangefinder? The best rangefinder Bushnell produces for the budget-conscious is the Bone Collector model. This laser rangefinder is fairly barebones, but it’s highly accurate and offers good light gathering capabilities. It’s also quite easy to use, with single-button operation. Unfortunately, it has a range limited to just 600 yards (more like 200 yards for deer), and it lacks many of the features that you might need for longer-range shooting. Finally, the Bone Collector LRF uses a 9-volt cell that fits a bit too snugly in the battery compartment. What’s The Best Bushnell Rangefinder Money Can Buy? If money isn’t an object but functionality is, the Bushnell Elite 1-Mile CONX Laser Rangefinder is the top of the line. This innovative product pairs via Bluetooth with your Android or iOS smartphone for extended functionality, including the ability to view the range information straight from your mobile device. It can range highly reflective targets from as far away as a mile, and is able to pinpoint the distance to that trophy buck from 600 yards off. Even better, the rangefinder pairs with Kestrel wind meters for advanced shooting profiles. Unfortunately, this rangefinder doesn’t provide ballistic data for archers, and it uses the rarely-found CR123 battery. Compounding this problem is the fact that the battery life tends to be quite short when Bluetooth CONX is enabled. Do Bushnell’s Rangefinders Have Any Common Characteristics? 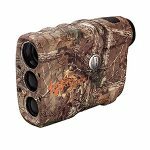 Bushnell manufactures a wide variety of rangefinders, from those intended for hunters and competitive shooters to golfers who want that extra edge on the links. Still, there are some commonalities in the catalog. Most Bushnell rangefinders offer a very generous field of view, and the fast majority are powered by lithium batteries, either the CR–2 or the CR123 variety. When it comes to using your rangefinder, you don’t want to have to memorize a 1,000-page instruction manual to get the most out of it. You also don’t want to have to wade through multiple levels of menus just to turn on the laser. Fortunately, Bushnell realizes this, and makes their products as simple to operate as possible. Many of them use a single button for all the features, but the more complicated models add a “Mode” button to ease operation. I’ve never been confused by a Bushnell rangefinder, and have always found them simple to operate. What Features Does Bushnell Include In Its Rangefinders? There are a handful of features that Bushnell uses in its products. Many of its rangefinders, especially the ones designed for golf, have what is called Jolt technology. This makes the device vibrate within your hand when it successfully locks onto a target, giving you a tactile reinforcement that you’re lasing your subject. In addition, most of Bushnell’s rangefinders offer ballistic compensation information, helping you understand the difference in elevation between you and your target. Unfortunately, the most common Bushnell rangefinders are designed solely for rifle shooters or archers, with very few products providing the ballistic functionality for both types of shooting. 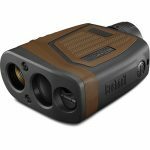 What’s The Eye Relief Like On Bushnell’s Laser Rangefinders? This is a tough one, because it varies from product to product. In general, though, Bushnell’s laser rangefinders offer adequate eye relief for easy use even with eyeglasses on. In addition, most of the variants provide for at least some diopter adjustment by twisting the eyepiece. This isn’t universal, though, so make sure you check for that feature when you are looking for the best rangefinder for your money. How Well Do Bushnell’s Rangefinders Transmit Light? Transmittance is crucial in a rangefinder, since your prey can often be found in low-light conditions or in shaded backgrounds. Most of Bushnell’s rangefinders feature fully multicoated optics to maximize light transmission, but there is one common problem: the use of black LCD displays to provide the range. Bushnell has begun using colored displays, but that’s only available in a handful of variants. What Are The Optics Like On These Rangefinders? The optics, generally speaking, are outstanding. As previously noted, Bushnell typically utilizes fully multicoated optics, and it doesn’t skimp on the components. When prisms are used for the optical system, the company makes use of BaK–4 prism glass, and the image quality is always quite good. Magnification ranges from 4X to 6X, typically, but the sight picture’s clarity, contrast, and crispness are always superb. Do Bushnell’s Rangefinders Have Good Focus? Typically, yes. Auto-focus is most commonly used, but there are differences throughout the product lineup as to what focus modes are available. Some models will only focus on the closest object while others will focus solely on whatever target is furthest away. The more feature-rich products will have Bullseye, Brush, and Scan modes to make getting an excellent, sharp image of your prey possible even when the terrain and brush might otherwise obscure it. How Durable Are The Company’s Rangefinders? This depends on the model, honestly, but most of Bushnell’s rangefinders are pretty durable. Some models feature Bushnell’s 100 Percent Bulletproof Guarantee, one of the best warranties in the industry. When a product is backed by this guarantee, the company will repair or replace a defective or damaged product without any questions asked. As far as weather resistance goes, Bushnell leads the industry. Its rangefinders are always waterproof and fogproof, with nitrogen-purged optics chambers and lenses that are O-ring sealed. In some cases, Bushnell even applies RainguardHD coating to the external surfaces of the objective and eyepiece lenses, which forces precipitation to bead up and fall away from your line of sight. Thanks for checking in with us on Bushnell’s rangefinders. While there are better choices for some purposes, the vast majority of this company’s laser rangefinders are among the best in the business. Really, you can’t go wrong with a Bushnell rangefinder, as long as you do your research and make sure you purchase a model that offers all of the features you want and need from your investment.